President Yoweri Kaguta Museveni on Thursday 18th, May 2017 paid tribute to Mzee Boniface Byanyima, describing the deceased politician as a champion of education and agriculture. The 97-year-old veteran politician passed away on Tuesday 16th, May 2017 at Nakasero Hospital in Kampala. Courtesy Photo/PPU. President Yoweri Kaguta Museveni on Thursday paid tribute to Mzee Boniface Byanyima, describing the deceased politician as a champion of education and agriculture. The 97-year-old veteran politician passed away on Tuesday May 16 at Nakasero Hospital in Kampala. 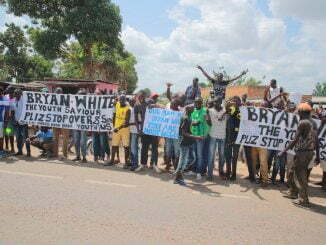 As a principled leader, Byanyima is remembered for standing his ground in the early 1960s to oppose the new independence , even when almost all Democratic Party (DP) Members of Parliament crossed the floor and joined the ruling Uganda People’s Congress (UPC). Museveni said Byanyima was among the pioneer Ugandans who loved teaching. He said his first interaction with Byanyima was in 1959 when the future president joined Mbarara High School where the DP icon was a teacher. 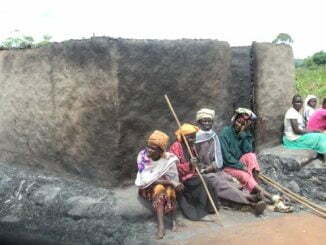 He notes that his contribution in education cannot be under-estimated, having been among the first people in Ankole to get education and become teachers. Byanyima taught Museveni in Junior one and two. He hailed him of his contribution towards modern farming in the Ankole region saying that Mzee Boniface Byanyima was among the first three groups of people to practice modern agriculture which included paddocking, ranching, and spraying of animals from ticks. Museveni also hailed Byanyima for playing a significant role as chairperson of DP for a long time. He noted that he had a unique character that he always stood his ground in politics. President Yoweri Museveni and Boniface Byanyima were once like father and son. While still in school, Museveni was adopted into the Byanyima family where he would spend his high school and university holidays. The Byanyimas treated him as their own, and to this day, Museveni’s high school and university books hold their place in the Byanyima family library. Byanyima would later narrate that even as a young boy, Museveni was ambitious and never hid his desire to be at the helm of political change and leadership, whether in his local community or on the national stage. Museveni himself has confessed that when he was entering politics, it was only Mzee Boniface Byanyima who understood and encouraged him. And for that he would be eternally grateful to him. “I was a very ardent supporter of DP and when I grew up I became very active after my A’level in 1966, I liaised with Byanyima who introduced me to some elders some of who I knew, others I didn’t know in 1967. 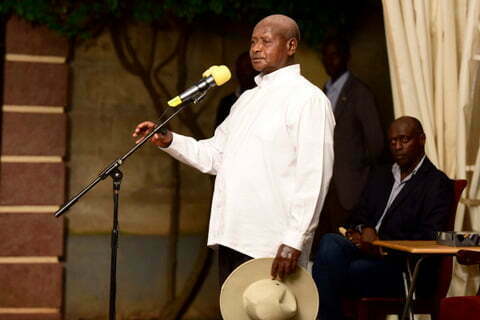 That is how we were able to do some work there,” Museveni said. Museveni noted that Mzee Boniface Byanyima has left a legacy having played his part and most of the times as a pioneer, starting new things. “Later on when I joined freedom struggle, although he remained in DP, we remained on good terms,” the president said. Born in 1920, Boniface Muyogoma Byanyima is a great-grandson of Kyamufumba Kya Ndagara Rwamigano, eldest son of Omukama Ndagara, the last King of Buhweju. In his early years he lived in the court of Chief Ndibarema in Nsiika, Buhweju. Byanyima started school at Kinoni Primary school where he is said to have completed three classes in one school year, moving on to Mbarara High School for Primary four. A gifted and disciplined student, he won a scholarship to Kings College Budo. He excelled at Budo and entered Makerere University College, where he studied Education. After graduation in 1951, he was posted to teach at Bishop Tucker Theological College, Mukono. Among his students were the late Bishops Amos Betungura, Yustace Ruhindi and Misairi Kauma among others. Byanyima returned to teach at Mbarara High School. He was a devoted teacher, who brought out the best from his students. He was known to be extremely punctual, strict but kind and approachable. A music lover, Byanyima taught himself how to play the piano and joined Mr Yuda Nyondo as a second pianist at St James’s Cathedral, Ruharo. Among his many students were Yona Kanyomozi, Ephraim Kamuntu, Amanya Mushega, Yoweri Museveni and Ernest Rusita. In 1954, Byanyima went to Exeter Universty in the UK to pursue a post-graduate diploma and on completion he returned to Mbarara High School. As Independence approached, Byanyima was persuaded by friends to contest the Ankole North East constituency. He said he joined DP because it represented the interests of the excluded. He won the 1961 election with a landslide and joined the DP pre-independence government as minister for public service. In 1962, there was another election which resulted in a UPC/Kabaka Yekka government. Byanyima was re-elected to parliament and served until 1971 when Idi Amin overthrew the government. 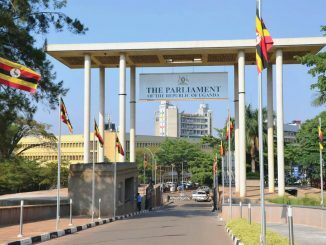 The Democratic Party had been banned in 1969 and Byanyima and 5 other DP MPs remained in Parliament as opposition MPs. He served as national chairman of DP throughout the period it was banned and was instrumental in reviving the party after the fall of Amin in 1979. A consistent champion of multiparty politics, of truth and justice, Byanyima retired from active politics in 1980 but remained an adviser to DP leaders. A successful rancher, Byanyima married Gertrude Kabwasingo, also a teacher and future political activist, in January 1956. They lived together for 52 years until Gertrude passed away in 2007. They had 7 children; Edith, Winnie, Bernard (RIP), Anthony, Martha, Abraham and Olivia. Mzee Boniface Byanyima will be buried on Sunday at his home in Ruti, Mbarara Municipality.